For its final production of the 2018 season, ODC Theater featured Of Iron and Diamonds V3: Alone Together, an entertaining piece full of self-conscious humor and dynamic reframing of what it means to perform and to watch. This reversal is built into the theater’s arrangement: the audience sits onstage, facing the tiered seating where much of the action happens. Performed on December 6, the piece opens with audience and performers peering at each other from the across the room, begging the question of who is the watcher and the watched? Alone Together is the third chapter of former ODC Resident Artist Catherine Galasso’s series of site-specific performances drawing from Boccaccio’s The Decameron. 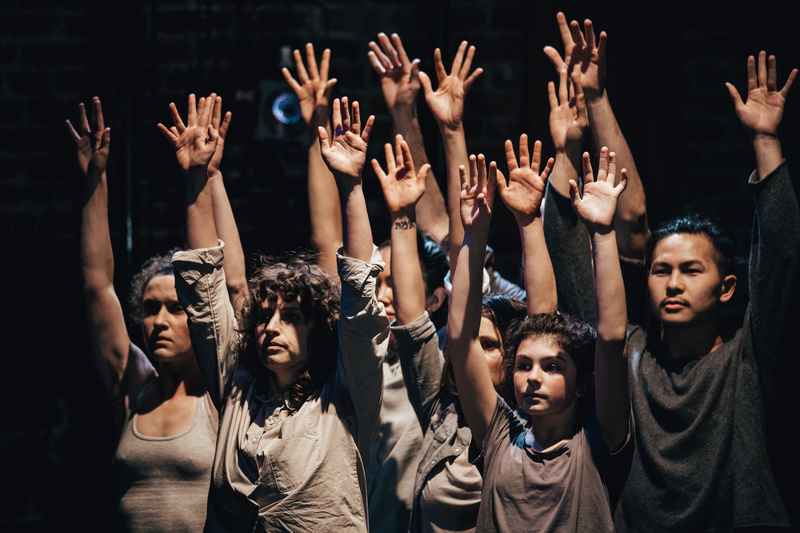 Overall, although the connections to the fourteenth-century Italian text (in which ten young people pass the time in isolation from the Black Death by telling tales) are loose, Alone Together, created in collaboration with sound designer David Cerf, explores the possibilities of art to connect and heal communities during a grim time. 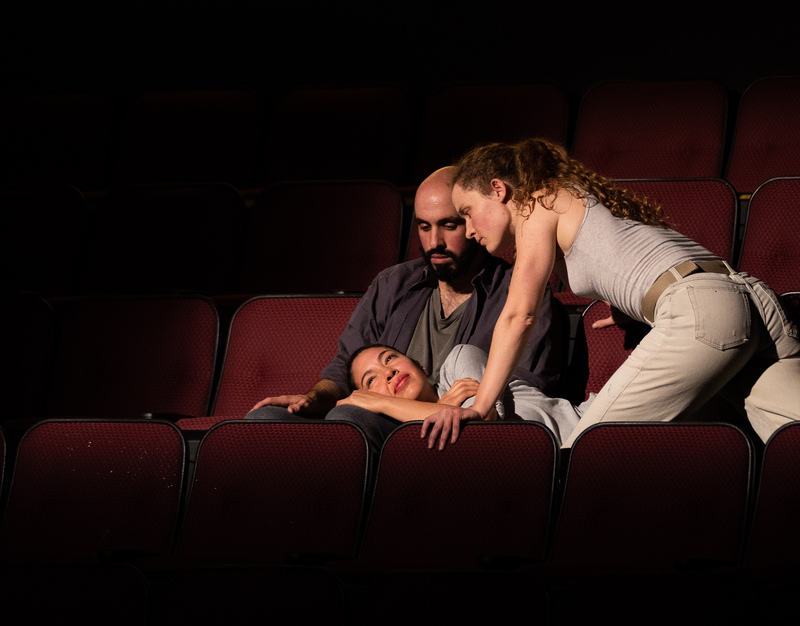 From left: Eric Garcia, Karla Quintero, and Cookie Harrist create drama in the theater seats. Photo by Robbie Sweeny. Indeed, one of the reliefs that Alone Together offers is pure entertainment. In a sequence of numbers that evoked Vaudevillian comedy, the cast of Bay Area performers (Arletta Anderson, Eric Garcia, Cookie Harrist, Hien Huynh, Phoenicia Pettyjohn, Karla Quintero, and Galicia Stack Lozano) flocks into both familiar and unfamiliar conceptual territory. Galasso and Cerf’s “shared language” of cinema builds an abstract, imaginative narrative punctuated by energetic climaxes that drew chuckles of recognition from the audience. The tiered seats and the floor space morphed into what appeared to be a circus, a dodgeball arena, a movie theater, and, most playfully, the keys of a synthesizer. Of course, the details of these settings are left to the imagination. However, the production is not without its earnest, dramatic moments. The first few movements feature an animated duet and dynamic pas de trois that conjure more direct links to The Decameron’s stories of unrequited love and tormented love triangles. A standout dancer is twelve-year old Galicia Stack Lozano, who enters the stage separately with an uncanny, powerful confidence. At times, she appears to lead the flock of dancers, at others she blends into the group, her smaller stature and precise movements ebbing in and out of focus. Galasso’s pieces frequently feature dancers outside of the “conventional” age range; previous works in this series have included a sixty-five-year old dancer and Galasso’s eight-month old son. All seven performers in “Alone Together.” Photo by Robbie Sweeny. The final act highlights just to what extent “the fourth wall is not a thing” for Galasso, Cerf, and their collaborators. As the soundscape swells, the performers reach into the seated audience to bring up audience members to walk across the floor and take a seat across the room. They appear to choose at random, asking, “Will you come with me?” Nobody said no.